LONDON - Retailer Foot Locker is launching a pan-European campaign promoting the Nike Air Max 90 shoe, featuring sports stars Theo Walcott of Arsenal FC, Bojan Krkic of FC Barcelona, Mario Balotelli of Inter Milan, and French hurdler Ladji Doucoure. A 30-second TV will debut in the UK, France, Italy and the Netherlands next week. The ‘Be the Revolution of you' campaign will encourage consumers to reinvent themselves, promoting the Air Max 90 colourway trainer which is exclusive to Foot Locker Europe. The sporting icons are featured alongside artists such as Italian hip hop group Club Dogo along with trainer fans. Online films offer a deeper view of their own personal styles. The campaign was developed by agencies 72andSunny, AKQA and Eyeka. 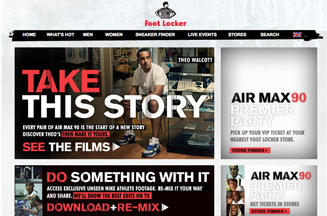 Consumers who visit the www.footlocker.eu site between 16 August and 13 September will be able to download interactive content and make their own films, with Foot Locker's favorite remix being aired on TV. The campaign will also feature at Foot Locker retail stores this month.